Qatar still has a lot of time for preparations, especially after recent shift to a first ever winter World Cup, played in November and December. This is why we only know 4 future stadiums of the 2022 World Cup. 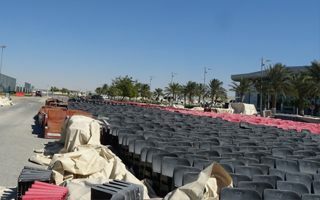 It’s also why there was no rush at the demolition site of old Al Rayyan stadium, the Ahmed bin Ali Stadium. First demolition works on the 21,000-seater were launched on Sept 30, 2014. After roughly half a year the site is cleared and no remains of the stadium are left in the way of… still to be revealed future stadium. Interestingly, the long demolition period was used to preserve and reuse as much of the building as possible. According to the Supreme Committee for Delivery and Legacy a stunning rate of over 90% recycled materials was reached. All the demountable equipment is already in use on the site: doors, windows, sockets, water piping have been used to equip site offices and worker accommodation. Flags and other decorative or symbolic elements were given for artwork. Main structure was also made usable again. Reinforcements previously hidden in the concrete and other metals were given to Qatar Steel for smelting. The concrete itself was crushed and will be used for levelling works. Soil excavated on site will either be sold or used for landscaping purposes. Al Rayyan is one of the cities (really it’s a modest suburb of Doha) already certain of holding the 2022 World Cup. While no final design for the 43,000-capacity stadium (downsizable to 20,000 in legacy mode) was released so far, the place is already on host list. Final selection will be made after further analysis of the tournament. As the Supreme Committee assures, all demolition works were carried out in a safe manner. Qatar is under severe criticism over working conditions and disrespect for human life, but recently the country assured no-one was seriously injured during the first million man-hours on stadium projects.